As long expected, the U.S. Federal Reserve hiked short-term interest rates in the U.S. at the conclusion of its 18-19 December 2018 meeting, increasing the target range for their Federal Funds Rate by a quarter point to 2.25%-2.50%. The risk that the U.S. economy will enter into a national recession at some time in the next twelve months now stands at 2.4%, which is up by roughly half of a percentage point since our last snapshot of the U.S. recession probability from early-November 2018. 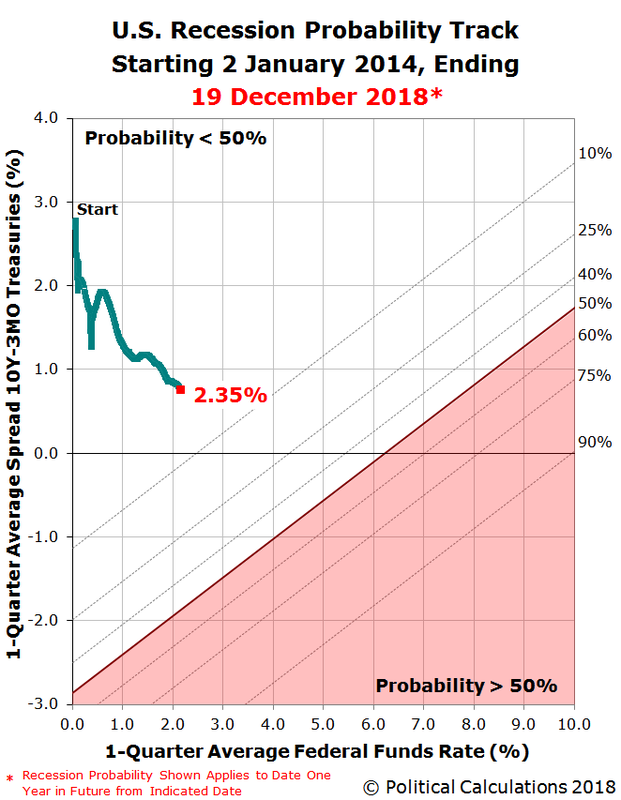 The current 2.4% probability works out to be about a 1-in-42 chance that a recession will eventually be found by the National Bureau of Economic Research to have begun at some point between 19 December 2018 and 19 December 2019, according to a model developed by Jonathan Wright of the Federal Reserve Board in 2006. That increase from our last snapshot is roughly equally attributable to the Fed's most recent quarter-point rate hikes on 26 September 2018 and to the recent flattening of the U.S. Treasury yield curve, as measured by the spread between the yields of the 10-Year and 3-Month constant maturity treasuries, which has seen the 10-Year Treasury yield decrease as the bond market has priced in increased prospects for a global economic slowdown. The market has a different perspective, where the CME Group's FedWatch tool is now anticipating no further rate hikes in 2019, and even the prospects of a rate cut in late 2019 or early 2020.